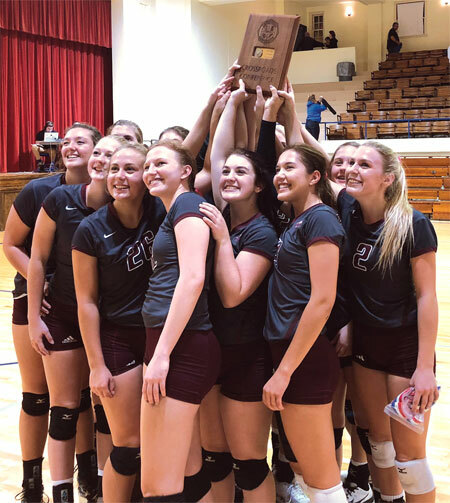 After a bumpy first set, Bruning-Davenport/Shickley rolled to the championship of the 2018 Crossroads Conference Volleyball Tournament. The 22-4 Eagles downed rival Exeter-Milligan 27-25, 25-9, 25-9, on Tuesday evening at the York City Auditorium. E-M had strong leads of 12-7, 13-10 as the first set unfolded in York. BDS took its first lead in the match at 17-16. The Timberwolves surged again and led the set at 23-19. Then, good play, some double hits and miscues saw the Eagles storm back and take the set. The second and third sets were all BDS with the Eagles cruising from the opening serve in both periods. "After a few adjustments, I think we went out and played well," BDS coach Kari Jo Alfs said. "Our front row put up a huge block...our back row pursued every ball and the setters did a great job of distributing it. Our mental game was there tonight. We had everyone come through for us tonight." Regan Alfs pounded 14 kills for the winners and Macy Kamler smacked seven. Jadyn Kleinschmidt slapped down four kills. Jordan Bolte put up 14 assists for the Eagles and Alfs had nine. Caitlin Mosier drilled three aces and Alfs and Kleinschmidt both belted two ace serves. Kamler had four blocks and Alfs had two. Mosier, Kleinschmidt and Kamler all had eight digs. The Eagles play at a triangular at Sutton (8-18) with 3-19 Sandy Creek this Tuesday before joining E-M again in the D2-2 Sub-district on October 29-30 at Centennial. Joining these two squads in Utica will be 11-13 Dorchester, 6-20 Osceola and 1-24 Nebraska Lutheran. BDS made it to this year's CRC Final following wins against McCool Junction and Meridian. The Eagles downed the Mustangs 25-20, 25-10 last Saturday at the York High School. Alfs thumped seven kills and Kleinschmidt had six. Kamler added four kills. Bolte had 10 assists and two ace serves. Kleinschmidt nailed two ace serves. Alfs posted eight assists. Kamler and Alfs both had two blocks. Kleinschmidt tallied 11 digs for the winners. On Monday, October 15, BDS downed defending champion Meridian, 23-25, 25-15, 25-19, 25-20. "I thought we started the match out very flat and had a tough time getting going," Alfs said. "Tonight, our hitters had a difficult time connecting and didn't seem to get on a roll." Alfs crunched 20 kills and Kleinschmidt had 18. Kamler connected on 14 terminations. Alfs posted 25 assists and Bolte had 23. Sera Johnson ripped four ace serves. Alfs and Mariah Silva both had three blocks. Kleinschmidt and Mosier both collected 20 digs. Kamler tallied 15 digs and Bolte had 10. "I'm not sure if we were looking ahead to the championship match and overlooked Meridian or what was going on but we just didn't have any fire," Alfs said.